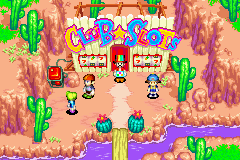 Lucky Country Club Slots is a type of minigame in Mario Golf: Advance Tour. It is located in Lucky Country in the Dunes Area. When the player comes to this place, a man stands outside a door. The player follows him through the door to a place with four Warp Pipes. All warp pipes leads to different golf courses: Marion Course, Palms Course, Dunes Course and the Links Course. 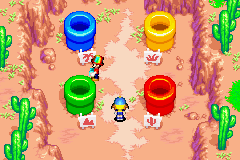 The player must complete each level to progress to the next. Each level contains three holes. Before each hole, the player gets three clubs plus a putter, which are selected by playing on a slot machine. In the first column, are the Wood clubs, the second Iron clubs and the third Wedge clubs. Also in each column there are some stars. If the player can plot three stars, they can use all of their clubs, but if the player gets only one or two stars, they can not use any club from that category. With help of these four clubs, the player must get in the hole in par or under. If the player can not come in par or under in a hole, he or she must restart from the beginning. If the player can complete all four golf courses, he or she gets a Muscle Drink as a reward and the Mushroom Course will be unlocked in the Quick Game Club Slots. This page was last edited on February 13, 2018, at 07:48.